KRCL Recruitment 2018: The candidates who are looking Railway Jobs, this is the good opportunity. The Konkan Railway Corporation Limited has been released the Employment Notice to recruit the 100 Trackman, Points Man, Khalasi etc. for the vacant seats. 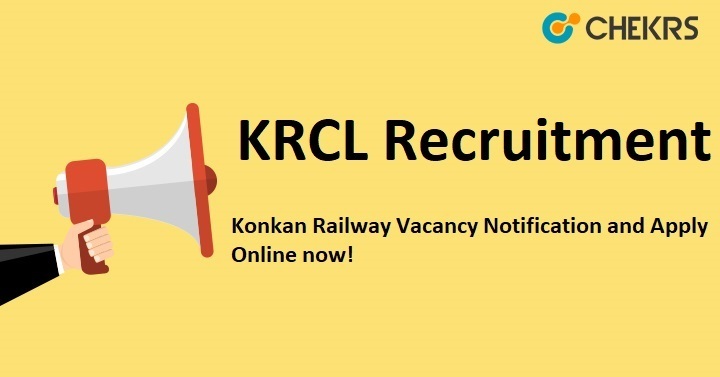 Candidates can apply for KRCL Recruitment 2018 Application Form which has been already started and will be completed on 16th September 2018. As per the KRCL Vacancy Notification, candidates will be selected for the required posts basis on Written Exam. So, candidates don’t waste the time and apply for the Konkan Railway Trackman Recruitment 2018 on or before the last date. For more details about the KRCL Vacancy candidates read the whole article. Click on the option “APPLY ONLINE” which will open a new screen. Candidates note down their registration number, ID & Password. Then apply for the application form and fill the correct information. Candidates can proceed to upload Photo & Signature as per the specifications are given in the Guidelines for Scanning and Upload of Photograph and Signature. Click on ‘FINAL SUBMIT’ ONLY after verifying and ensuring that the photograph, signature uploaded and other details filled by you are correct. After completing online, candidates are advised to take a printout of online application forms & payment receipt for future uses. Remarks: In regards to any query or review about KRCL Recruitment 2018, we welcome your valuable comments in the commenting section below and our team will revert you in a short while.